Článek vyšel také na blogu autora: Czech the World. Bukhansan National park is a perfect day trip from Seoul in South Korea. Relax from the busy city and explore some stunning natural scenery. 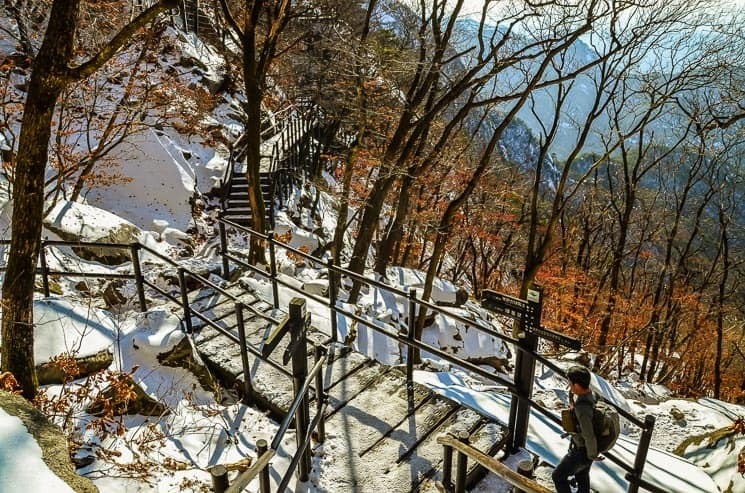 You can get to the mt Bukhansan hiking trail by public transportation. You will be amazed by an incredible view of Seoul. We have prepared an Ultimate Online Blog Guide for you with all the information you need for hiking Bukhansan National Park mountain. Climbing Bukhansan is a great adventure! The biggest advantage of Bukhansan mountain is, that it’s easy to get there by public transportation (subway) from Seoul. It’s an amazing and popular day trip from Seoul. How to get to Bukhansan trail? Take the metro (subway) – Orange line number 3 (direction to Daehwa). Get off at Gupabal Station (Exit 1). Get off at Bukhansanseong Fortress Entrance (북한산성) station. Beware, that waiting lines on bus stations could be really long in the high season. If you hike in a group, you can take a taxi instead (it should cost around ₩6,000 from Gupabal to Park entrance). After that just follow signs “Baegundae” or other people (there will probably be a lot of other hikers). You can grab a map from the Information Center, which is located at the entrance. Take the same route back to Bukhanseong Fortress. Continue to the other side of the National Park. If you choose the second option, than just follow signs to “Daedongmun Gate”. After you arrive in the city, continue to Ui-dong bus station and take a bus to Suyu subway station. 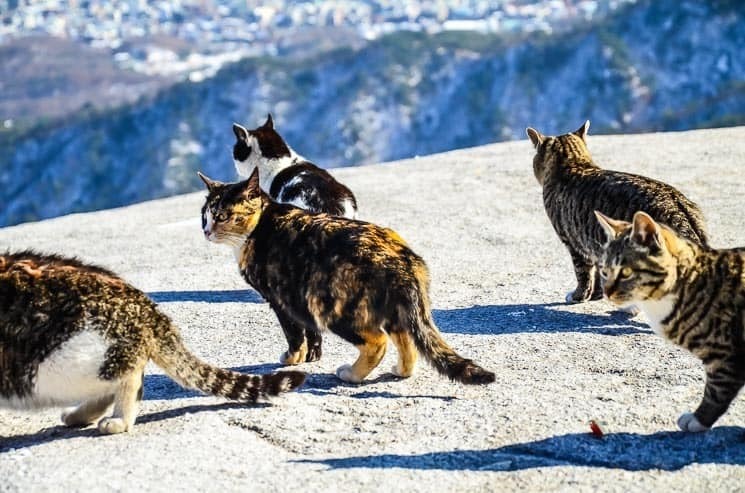 Avoid weekends if possible – Bukhansan hiking trails are much more crowded. Start hiking as early as possible – you will avoid the biggest crowds and waiting lines for the bus. 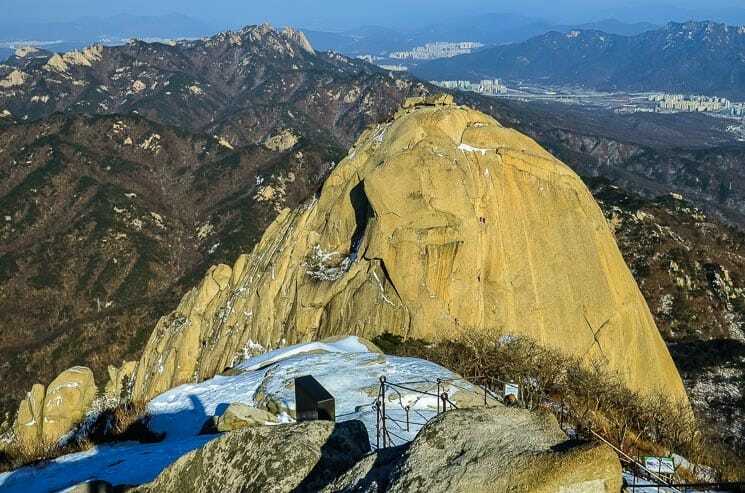 Spring or Autumn is the best time to visit and climb Bukhansan. It’s usually the nicest weather. Temperatures on the hiking trails are not as high as in the summer and not as low as in the winter. The scenery is the most beautiful with amazing spring or autumn tree colors. It is going to be less crowded than in summer, but you can still expect a lot of people. I would recommend other times to visit than in summer. It is very crowded! Actually, Bukhansan National Park is listed in the Guinness World Records Book as the “Most Visited National Park per Unit Area”. The temperatures on the hiking trails tend to be very high and climbing the trail will be more demanding. 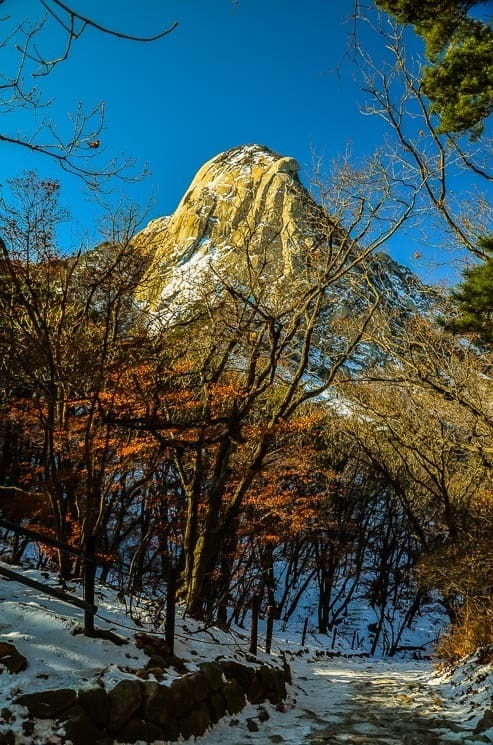 Winter scenery of Bukhansan National Park is also stunning! Just be aware, that temperatures tend to go below freezing point and hiking trails could be very frosty and slippery. Trail is much less crowdy in the winter, but you will still meet many other hikers there. Hike time without transportation: Plan at least 4-5 hours to complete the full hike to Bukhansan mountain. Plan rather 5-6 hours in high season because of the crowds. Hiking difficulty: Bukhansan hike is a moderate hike with some steep and strenuous parts. Be prepared for a lot of stair climbing with steel cables at the highest part of the trail. The trail is not for hiking beginners. If you are a beginner, you should think about hiking with an expert guide. What to wear: Dress in more layers and definitely take some raingear and wind jacket. The weather can change quickly. It is also a good idea to wear some hat and use sunscreen because there is not much shade at the top and sun can be very strong. Definitely wear gloves during the winter season. Food and Drink: There isn’t any place, where you can refill water on the hiking trail, so bring plenty of water with you. Bring enough food too. I would recommend some high protein muesli bars or nuts. Korean hiking style: Hiking in South Korea is a social activity. Don’t be surprised of seeing groups of hikers doing picnics at the top of mt Bukhan mountain or even drinking Soju on the way. Be prepared for some pushy people on the trail too. It’s usually the best to let move out and let them go their fast pace to the top. Trail leads mostly through the forest. National Park entrance admission: The park entrance is completely free! Just if you drive there by car, the parking fee is between ₩2,000-8,000. Opening hours: Hiking is allowed from 2 hours before sunrise till sunset. Check actual information on the official website. I have prepared for you a detailed map of the whole Bukhansan hiking trail with all the important places. You can export this map and import it to your mobile map application such as Locus Map or Maps.me. I can highly recommend Kimchee Downtown Guesthouse, which is one of the cheapest and have a nice central location with a 2-minute walk from the train and metro stations. Alternatively, you can sleep in the more luxurious G2 Hotel Myeongdong, also right in the center. 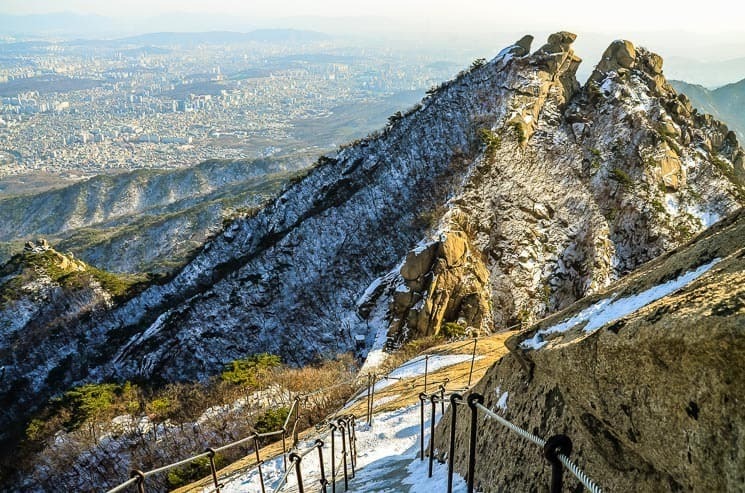 Hiking Bukhansan could be dangerous for less experienced hikers, so it could be a good idea (especially for beginners) to hike mt Bukhansan with a local mountain hiking expert guide. You will not need to worry about planning and safety restrictions and can enjoy fully just the hike itself. You will get a delicious Korean lunch box too. Book this tour here. 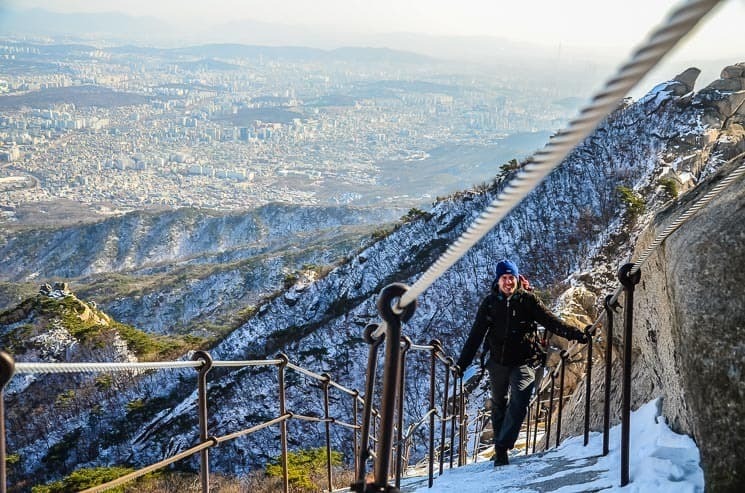 I hope this blog post will help you with your hiking climb trip to mt Bukhansan and if you have any comments or suggestions, please leave us a comment. Would you like some other hiking tip? How about Etna Volcano Expedition. The post Bukhansan National Park, Seoul appeared first on Czech the World. Článek Bukhansan National Park, Seoul vyšel také na blogu autora: Czech the World.